If you’re an iPhone user and have been accessing your Gmail Inbox via the iPhone ‘s Gmail native app, you’ve probably been wishing the app to have push notification feature. This means, that everytime you receive a new email message, your iPhone will notify you via the same notification box that pops out everytime you receive an SMS message. Well, actually there is a new app that does that finally and it’s called GPush (iTunes Link). Available now at the iTunes Apps Store, GPush is a simple iPhone app that does one thing – send you a notification whenever a new message arrives on your Gmail Inbox. Simply as it is and yet it is the most wanted feature of the iPhone’s native Gmail app. GPush relies on push technology rather than the more power-hungry “data fetching” technology. This means that the app will not drain to much of your iPhone’s precious iPhone charge. 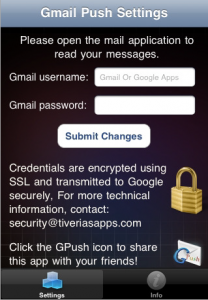 Additionally, GPush also gives you several options on how you want to be notified of incoming email messages – ring, vibrate, pop-up message on your screen or the GPush icon displaying how many incoming messages you have on Gmail. GPush is a must-have app if you access your Gmail on your iPhone. It’s currently available at the iTunes Apps Store for $.99. I’m pretty sure it’s just an introductory price as earlier published price for the said app was said to be around $3. So, if I were you, I’ll grab this app right now.